I paused at the edge of the sidewalk, not wanting to walk any farther. My kindergartener started crying as the bell rang, my toddler was still strapped in the car (in her pajamas), and I hadn’t even washed my face. How had we ALL managed to sleep in?!? Judgment washed over me as I spotted two women who had gone to high school with me chatting by the door of the school. The second bell rang. It was official. We were late. Even if you don’t oversleep and miss the bus, getting out the door in the mornings is no easy feat! There’s always arguing, nagging, and a mad scramble to get out the door. But once you have a morning routine for school days, your life will be much easier (even on the days when you oversleep). Since that day two years ago, I’ve gotten my school-day morning routine nailed down. It’s not always perfect (we all tend to drag a little on Mondays), but we have extra time built in so there’s no mad rush to the bus. Even if we oversleep, our mornings are much smoother. Sound fabulous? 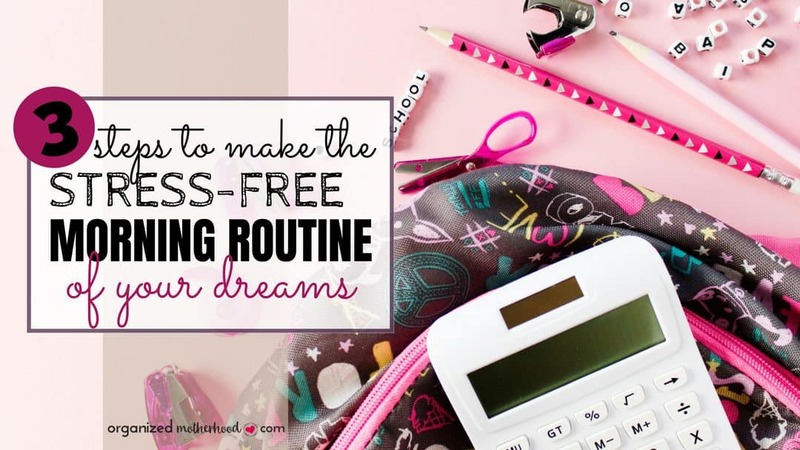 Here’s how to get your morning routine set up so that even Monday mornings run smoothly! Not everything needs to be done in the morning. In fact, a solid morning routine starts the night before. If you struggle to know what needs to be done ahead of time, get the Organized Motherhood Routine Bundle to create your ideal morning and evening routines. Set yourself up for success by laying out your kids’ clothes, setting the table with breakfast foods, and packing lunches ahead of time. Use a hanging organizer to set out six weather-appropriate outfits (including underwear and socks) on Sunday as you’re putting away laundry. Your kids will have a choice every day, but you’ll still ensure that they’re dressed appropriately for school. After dinner, have your kids set the table with breakfast foods and dishes. Set out cereal, bowls, spoons, and juice glasses. You could even make overnight oats in the Crock Pot for an easy breakfast idea that cooks while you sleep! Kids love to feel like they have a choice. One of the key principles in Love and Logic, one of my favorite parenting books, is that giving kids choices makes them feel empowered but also less likely to argue about the things that matter. There’s no harm in asking your kids if they want to drink cranberry juice or orange juice with their breakfast, and the little decisions will make your kids happier (and your morning smoother). Giving your kids choices also teaches them about consequences. For example, if your kids get dressed and eat their breakfast quickly, they’ll have time to watch ten minutes of cartoons. However, if they play in their room and then fight with their sister at the table instead of eating, they won’t have time for cartoons. While it’s important to have your morning routine streamlined and set up in advance, some choices and small decisions will help you child feel more in control. Keep your kids on track with a printable chore chart. 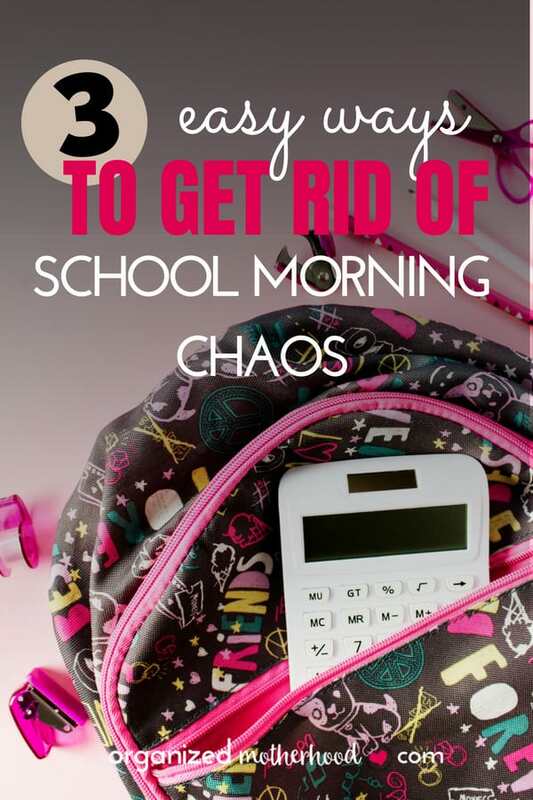 Remind them to make their beds, wash their faces and brush their teeth, and get ready for school without nagging! Use a chore chart or even make your own chart specifically for mornings. Give your kids a sticker for each task that they complete without being reminded. You could also laminate the chore chart and reuse it each week. Get the Organized Motherhood chore charts here! The hardest part of getting on a routine is actually making it a habit. But by planning ahead, using choices to stop arguments, and automating as much as possible so you don’t have to nag, you’ll be on your way to having a great day (and a smooth morning)!